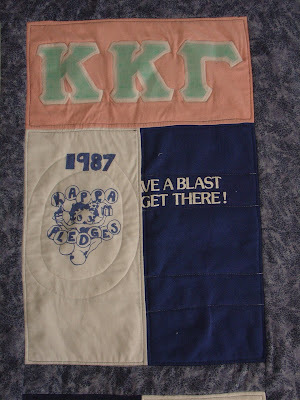 My niece, Missy, asked me to make a quilt from her sorority T-shirts and sweats. I cut all the rectangles twice as long as wide. These proportions give you more options in the arrangement. The key to using knits in a quilt is to back each piece with a stablizer (iron-on light weight interfacing). Hint: I would avoid using heavy sweatshirt fabric. I removed the stablizer from these rectangles after it was assembled because they were too stiff.